Young men trained to “fight the seals” in Dry Bay by sitting every day in a glacial stream; going after the animals meant stalking them through frigid water, then charging on foot. At Yakutat, Glacier Bay, and other places, hunters used white-camouflaged canoes to harpoon seals among floating glacial ice. 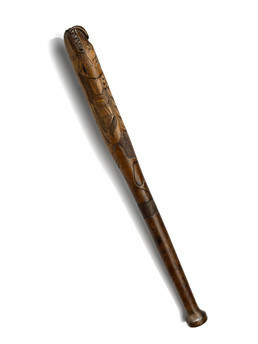 They killed them with clubs like this one, which is carved with the image of a sharp-toothed animal with a long tongue, possibly a sea lion but lacking the large eyes that usually mark this animal in Tlingit art. Behind it is a killer whale with a tall dorsal fin. Donald Gregory: Heavy. Yew wood? Delores Churchill: . . . What is the name of yew wood in Tlingit? Clarence Jackson: S’aks [yew wood]. Donald Gregory: . . . Hard to tell what that is, his tongue slipping back. Donald Gregory: It’s got sharp teeth. It looks like a claw on the side and then there’s a whale carved on both sides. I can’t tell if this is feathers or scales, looks like a flipper. Maybe this is a sea lion or – I don’t see any nostrils but – this could be representing his back flippers and his front flippers. It’s got a lot of cross hatching in it. Rosita Worl: Wow that’s a realistic whale. Donald Gregory: A killer whale. . . .
Clarence Jackson: What would have a long tongue? Donald Gregory: I don’t understand what this is either off the side, maybe something coming out of his mouth as he’s going. Clarence Jackson Could be. . . . Daasá héi tláx yéi koowáat’ a loot [what is it that would have such a long tongue]? Peter Jack: Sea lion maybe. Donald Gregory: Could be, because it’s got the teeth. One of the giveaways for when you’re seeing the sea lion, it always has a big eye. This one doesn’t have a big eye. . . . Do you know what this could be, it could be a killer whale chasing the seal, that’s why everything is pluming back out of its mouth and you know this back here. Clarence Jackson: That could be. A killer whale will ram the beach too, you know. Donald Gregory: He’s tired, yes. He’s been chased a long way. Last chance. . . . There’s a killer whale here, and it’s right behind it, if it’s the seal that this is representing or whatever animal that it could be chasing it. And then on the top here it looks like either slash marks or plumes coming back and of the mouth too, the same thing something is coming out that is going really fast that direction. Aron Crowell: Is it for halibut? Clarence Jackson: I don’t think it’s for halibut. It’s too small. Donald Gregory: Too small. You don’t need a big one for that, you just hit them in the nose. Aron Crowell: . . . We need to record a name for it. Clarence Jackson: X’ús’[club], x’ús’ is the name. George Ramos: Aan tsaa shakdudéx’jee. Yees kaa áyá aadéi kindunaach yaa tsaa keení yei áyú. Clarence Jackson: It could be. Clarence Jackson: Yes, that’s what he’s saying. They used to club seals long ago before rifles. Delores Churchill: Yes, because even when they shot them when I was a little girl, you had to row real fast, because they’d go down. Clarence Jackson: Yes, to get them. Donald Gregory: That’s why we hunt at Morris Reef, in case they sink you can still get them. Clarence Jackson: Yes, that makes sense. George Ramos: They used to tell the young men ‘You have to go in the water.‘ And they’d go down where the seals sitting like that. They’d go down right below them and run up on them, and all the seals would start running down. George Ramos: And if you didn’t know how to club them, the seal would bite the club in your hand. That’s what they used to say. I tried to imagine it, especially the Dry Bay River which is fed by a glacier. That’s where the boys used to go in the water, sit in the water to get used to it. And then I’d think hypothermia, what are you talking about. The temperature of that water I find is 37 degrees, I know because I fished that. It takes a half an hour for your hand to go like this [curling fingers]. And these boys just had to sit in there every morning. . . . They had quite the club to do it. I don’t know what the club looked like.